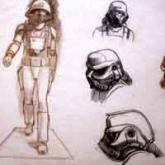 The conceptual designer created the look of characters including Darth Vader, Chewbacca and R2-D2 and C-3PO. He also worked on the original Battlestar Galactica TV series and Steven Spielberg films E.T. and Cocoon, for which he won an Oscar. A tribute on his website said: "We'll miss you Ralph. You will forever be the brightest star in our galaxy." Born in Gary, Indiana, McQuarrie began his career as a technical illustrator for aeroplane manufacturer Boeing and designing film posters. He also animated US TV network CBS's coverage of Nasa's Apollo space programme. In 1975, he was hired by Lucas to design some of the characters and scenes for his "space opera" Star Wars. As well as designing some of the sets including the desert planet Tatooine, McQuarrie also did the conceptual drawings for many characters. His rewards included an uncredited role in the sequel The Empire Strikes Back, as General Pharl McQuarrie, and his own action figure. In a statement, Lucas said: "His genial contribution, in the form of unequalled production paintings, propelled and inspired all of the cast and crew of the original Star Wars trilogy. "When words could not convey my ideas, I could always point to one of Ralph's fabulous illustrations and say, 'do it like this'." McQuarrie also designed the alien spaceships in Steven Spielberg's Close Encounters of the Third Kind and E.T. In 1985, he was presented with an Academy Award for Visual Effects for the film Cocoon - about the residents of an old people's home given a new lease of life by visiting aliens. The statement on his website praised "an especially kind, sensitive, deep, modest, funny and fascinating gentleman. "His influence on design will be felt forever. There's no doubt in our hearts that centuries from now amazing spaceships will soar, future cities will rise and someone, somewhere will say... 'that looks like something Ralph McQuarrie painted'."